The action at Kolozab (called Kolozomb by the French) was the second of three actions in which the French sought to force crossing of the Wkra River on 24 December 1806. 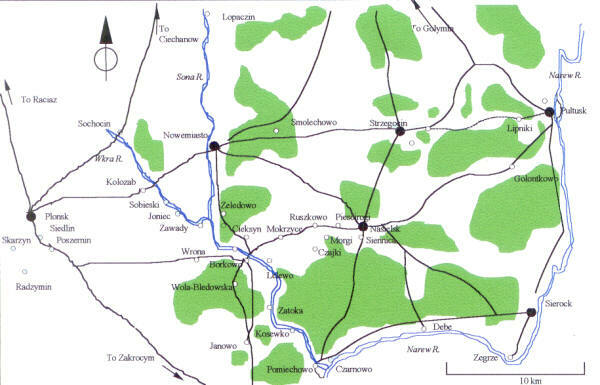 Like the similar action at Borkowo a short distance downstream, the action at Kolozab resulted in Russian withdrawal. Unlike Borkowo, the French made a serious effort to rapidly seize the bridge under enemy fire, incurring significant losses as a result. English language descriptions of the battle are vague and confusing regarding both the Russian forces deployed and the course of the action. By placing the action in the context of the other actions on the Wkra, it is possible to clarify both the forces involved and the broader significance of the action. Early in the morning of the 24 December 1806, French columns marched on three points in the Russian defensive line – Borkowo, Kolozab and Sochocin. The first of these posts was defended by a small force under the command of Major General Ivan Semenovich Dorokhov while the defense of the latter two points fell to Major General Mikhail Bogdanovich Barclay de Tolly. Barclay had commanded the Advance Guard of the corps of Lieutenant General Levin Bennigsen, composed of forces drawn from the Russian 4th division. With the withdrawal of the Russian forces to the Narew-Wkra line during the first ten days of the month, Barclay’s force was positioned on the right of the first line of defense along the Wkra River. Barclay’s job was to secure the Russian right against any attempted flanking maneuver by the French towards Ciechanow and Nowemiasto. By definition, this task was a delaying action with the purpose of buying sufficient time for the Russian forces to concentrate in order to meet the French in force. While Bennigsen’s preparations had been entirely defensive in focus, Field Marshal Mikhail Fedorovich Graf Kamenskii, who had joined the army on 21 December and assumed overall command of the combined Russian forces, had decided to conduct an offensive to drive the French south of the Narew- Vistula line. Therefore, from the 21 December Barclay not only secured the right against a French attack but also screened Russian forces assembling at Nowemiasto and Lopacin and secured the bridgeheads for an advance in two columns by way of Kolozab and Sochocin. The night of 23-24 December 1806 had seen the start of the long-anticipated French offensive against the Russian positions on the line of the Narew and Wkra rivers. The first French assault struck at Czarnowo, the hinge of the L-shaped Russian first line. By 4 AM on the 24th, the Russians at Czarnowo were retreating towards Nasielsk. The second phase of Napoleon’s plans to dislodge the Russians from their positions involved a turning movement on their right. The key to this turning movement was the seizure of the bridges at Kolozab and Sochocin. The village of Kolozab stood on the right bank of the Wkra, perhaps a kilometer from the river and 8 kilometers ENE of Plonsk. Nowemiasto stood 8 kilometers east of the Wkra on the right bank of the Sona River, which joined the Wkra about 7 kilometers due south of the town. The bridge at Kolozab was one of three bridges over the Wkra north of Pomiechowo. The bridge at Borkowo stood roughly 10 kilometers to the southeast and the bridge at Sochocin roughly 4 kilometer to the northwest of Kolozab. Between Kolozab and Borkowo were three fords at Sobieski (near Pruszkowo – Pruski in French reports), Joniec and Zawady. Between Kolozab and Sochocin the river appears to have been unfordable, its course broken by two islands. Barclay established his position near Kolozab on the left bank of the Wkra River astride the main road from Plonsk to Nowemiasto. This position was therefore essential for covering Nowemiasto, where roads branched to the southeast to Nasielsk, the northeast to Golymin, and due east to Strzegoczin and beyond to Pultusk. The river itself was wide and deep enough at this point to form a significant obstacle, unlike the Sona to the east, which was much smaller. Both banks of the river lacked any commanding terrain of note. For several kilometers north and south of Kolozab the ground on either side of the river was generally level, but further up and downstream the right bank grew steeper. Between Kolozab and Nowemiasto the road passed over gently rolling hills with scattered patches of woods before reaching Nowemiasto, leaving no readily defensible point between the Wkra and Sona. To the north of this road stood a substantial patch of woods extending up to the left bank of the river that anchored Barclay’s right. To the south the ground appears to have been generally open according to early 20th Century maps, but may have been more wooded at the time, which made Barclay’s left more vulnerable. Barclay’s command included detachments at both Kolozab and Sochocin, the forces being drawn from the Advance Guard (part of 4th Division) and the 2nd Division. The forces at Kolozab included two battalions of 3rd Jäger, three squadrons of Isoum hussars, and a half battery of horse artillery (6 guns). Supporting these forces were the Efromov-V Cossacks (probably distributed in patrols along the river up and downstream) and the three battalions of the Tenguinsk Musketeer Regiment which was positioned in the woods between Kolozab and Sochocin on the left bank of the Wkra in order to support either position. Forces at Kolozab proper amounted to approximately 900-1,100 infantry, 4-500 hussars and 4-500 Cossacks. The forces positioned in the woods to the north amounted to an additional 1,600 infantry. Marshal Pierre Francois Charles Augereau commanded the French forces opposing Barclay. Augereau’s VII Corps was composed of two divisions of infantry and General Durosnel’s brigade of light cavalry. In addition, the two light cavalry brigades of Generals Milhaud and Watier from the Cavalry Reserve were attached to VII Corps. On the evening of the 23rd, Augereau’s 1st Division was positioned on the Zakrocym-Plonsk road between Plonsk and Poszernin along with the Corps artillery park, which was at Siedlin. Desjardin’s division had marched from the bridgehead at Zakrocym on the 19th and 20th of December, and had reached the vicinity of Plonsk by the 21st. Durosnel’s cavalry brigade and 2nd Division were on a parallel route approaching Plonsk 4-5 km to the west, the cavalry at Skarzyn and the infantry at Radzymin. Milhaud’s cavalry brigade screened Augereau’s force to the east, covering the routes to Kolozab and Sochocin while Watier’s brigade provided a screen to the north, between the routes to Sochocin and Raciaz. Augereau directed his 1st division, commanded by Général-de-Division Jacques Desjardin, and the light cavalry brigade of Général-de-Brigade Edouard Jean Baptiste Milhaud against Kolozab. Desjardin’s Division consisted of two brigades and an artillery battery, approximately 6,300 men. The first brigade, under the command of Général-de-Brigade Pierre Bellon Lapisse, was composed of 16th Légère (3 battalions) and 14th Ligne (2 battalions). The second brigade, under the command of Général-de-Brigade Jacques Lefranc, consisted of 44th Ligne and 105th Ligne. Milhaud’s brigade included 1st hussars and 13th chasseurs, about 900 men. A battery of horse artillery appears also to have been attached to this force. Lapisse’s brigade, with the horse artillery battery, received orders to seize the crossing while Lefranc’s brigade and Milhaud’s cavalry remained in reserve. Barclay had been watching the Wkra line since his retreat from Plock on the Vistula, and had held the positions of Kolozab and Sochocin for about two weeks. In the days leading up to 24 December, the Russian army had shifted its dispositions based on the new orders of Kamenskii, who had assumed command of the combined Russian forces on the 21st. As a result, Barclay’s command was reinforced with one or two battalions of 1st Jäger under Colonel Iakov Iakovlevich Davydovskii and, it seems, additional horse artillery. Barclay placed his own 3rd Jäger Regiment in position at Kolozab covering the route from Plonsk to Nowemiasto while Davydovskii’s force, along with 3 squadrons Isoum hussars and two guns, was positioned at Sochocin on the 22nd. At both points, the Russians occupied the bridgehead on the right bank with patrols and foraging parties stretching as far out as Plonsk. In the woods on the left bank between the two posts and in a position to support a French attack at either point stood the Tenguinsk Musketeer Regiment. A third force of unidentified composition was positioned at Wrona to the south of Kolozab to secure lateral communications on the right bank of the Wkra, although it’s not clear if this force was detached from Barclay’s command or Dorokhov’s forces from Borkowo. While the Russians were shifting forces to their right, increased French activity north of the Vistula alerted Barclay to the impending French offensive. French reconnaissances in the vicinity of Plonsk on the 20th and 21st of December had encountered Russian foraging parties. As the French advanced towards Plonsk between the 21st and 23rd, the Russian patrols withdrew to the bridgeheads. The position at Kolozab lacked any readily defensible terrain so Barclay had constructed a redoubt to cover the bridge in which he placed his 6 guns. The redoubt was supported by two battalions of 3rd Jäger with two squadrons of Isoum hussars in reserve. Cossack patrols and perhaps also some infantry detachments occupied advance posts downstream. In all Barclay had no more than 1,100 infantry and 650 hussars and Cossacks plus the half battery of artillery. On the 23rd, a French force, consisting of cavalry, infantry and artillery approached the Russian positions at Sochocin, Kolozab and Wrona, prompting Barclay to withdraw his forces to the left bank. At Kolozab, the opposing troops exchanged fire and the French actually prepared some rafts to threaten a crossing of the river. The Russians easily beat off the half-hearted attempts of the French who, having achieved their purpose of provoking the Russians into revealing their positions and strength, retired. During the night of the 23rd, Barclay’s forces braced themselves for the likelihood of a renewed attack the next day, this time in force. The bridge, which apparently had been left intact in anticipation of the offensive planned by Kamenskii, was dismantled, although the pilings were left intact. The morning of 24 December dawned cold and overcast and after an anxious morning, patrols finally brought word of an approaching French column. The French column, comprised of the 1st Division of Desjardin and Milhaud’s cavalry brigade, had concentrated at Plonsk at 4:00 a.m. and began its march on Kolozab around 8:00, approaching the Russian positions around 11:00 a.m. Desjardin, observing the redoubt and the general lack of cover for any troops on the right bank, ordered Lapisse to take a detachment of 2 battalions of 16th Légère downstream to locate a ford by which to turn the Russian position. The remainder of Lapisse’s brigade was ordered to engage the Russian forces on the opposite bank to occupy their attention while the turning maneuver was being executed. Lefranc’s brigade and Milhaud’s cavalry remained in reserve. While Lapisse’s column marched off to the southeast, Colonel Savary of 14th Ligne, supported by 11 guns under the command of battalion commander Dubois, advanced on the bridge, supported on his right by the remaining battalion of 16th Légère. Savary detached one battalion of 14th Ligne to seek a crossing about one kilometer to the north. The details of Savary’s orders are not clear, but the intention appears to have been to engage the Russian forces rather than to storm the bridge outright. Savary, however, apparently seeking glory and impatient of waiting for the turning maneuver to develop, decided to force the crossing. Around noon Savary assembled the grenadiers of his regiment with the battalion of 16th Légère deployed on the riverbank to provide fire support and the 11-gun battery directing its fire on the redoubt to try to neutralize the Russian artillery fire. Tearing planks off houses on the approach to the river, the grenadiers stormed the bridge, laying the planks across the footings. Although they sustained serious casualties, the grenadiers made it to the other bank. Observing the French assault on the bridge, Barclay ordered one squadron of Isoum hussars under Lieutenant Gluskov to charge the French grenadiers who had reached the left bank. Gluskov charged the French with his hussars, inflicting considerable casualties among the disorganized party that had gained the left bank, Savary being among those killed. More French swarmed over the bridge, however, and a small party of French cavalry managed to swim to the left bank. At about this point in the action, Barclay was alerted to the approach of Lapisse’s column on his left. Lapisse had found a ford about 1500 meters downstream just beyond the village of Pruszkowo. Crossing, Lapisse drove back the Cossack patrols and quickly marched to attack Barclay’s flank, making contact shortly before 1:00. Barclay realized that he was outflanked and that it was hopeless to try to stop Lapisse’s force and contain the French at the bridge with the small forces that he had, particularly in light of the overall strategic situation. In addition, orders to withdraw on Strzegoczin were issued by Kamenskii from Nasielsk around 12:30 and seem to have arrived at Kolozab between 1:00 and 1:30. Barclay deployed the other squadron of Isoum Hussars that he had at his disposal against the head of Lapisse’s column, which seems to have held them up momentarily, and ordered a retreat towards Nowemiasto. Lapisse, faced with only a small body of horse, deployed his battalions and continued his advance. With Lapisse’s force on the left and 14th Ligne passing over the makeshift bridge in force the retreating Russians were hard pressed. While the infantry and cavalry managed to withdraw in good order, 6 guns emplaced in the redoubt could not be withdrawn in time and were captured by the French who by this point outnumbered the Russians by 2-1 on the right bank. Barclay’s forces withdrew down the main road towards Nowemiasto. As the remainder of 14th Ligne and 16th Légère crossed at the bridge, Lapisse formed them up and set off in pursuit of the Russians towards Nowemiasto. As the Russians began withdrawing from their positions (around 1:30), Captain Lesecq of the engineers had set to work rebuilding the bridge with his party of sappers. By 2:00 the bridge was passable and Milhaud’s cavalry, Lefranc’s Brigade (44th and 105th Ligne) and the artillery crossed to the right bank. Milhaud joined Lapisse’s forces in pursuit of Barclay, although the pursuit was limited to driving the Russians back and securing the bridgehead. The forces of Lapisse and Milhaud bivouacked a short distance from the river that night. French casualties at Kolozab are given as 33 dead, 225 wounded from Desjardin’s division. There does not appear to have been any casualties in Milhaud’s brigade, which was only involved in the pursuit. Lapisse’s brigade incurred the majority of these casualties with 14th Ligne suffering the most. Casualties from Lefranc’s brigade are included in this total, although Lefranc’s regiments were engaged to the north at Sochocin against the Tenguinsk musketeers. The 14th ligne had ten officers killed and wounded in the crossing of the Wkra of 24 December. The other French regiments at Kolozab do not appear to have suffered any officer casualties in the action. Russian losses are not stated in sources but seem to have been substantially lighter. The action at Kolozab is interesting in that both sides achieved their objective to some degree, although neither side is immune from criticism. Barclay’s position was a difficult one, and clearly he was not expected to do more than delay the French. However, given the proximity of the ford at Sobieski (and indeed others farther downstream), the failure to deploy infantry at the ford or to cover his left seems a serious omission. A battalion of Tenguinsk, it seems, would have been sufficient to slow Lapisse sufficiently to hold the position longer and prevent the loss of the artillery without overly weakening the central reserve between the two posts he was defending. On the French side, Savary and his men demonstrated ample bravery and élan, receiving high praise from Desjardin in the report of the battle and Napoleon in his 45th Bulletin. However, the wisdom of Savary’s actions is questionable. At Borkowo, a turning movement alone was sufficient to dislodge the defenders and deliver the bridge into the hands of the French with an insignificant loss of life. The substantially higher losses suffered at Kolozab are the direct result of the storming of the bridge, an action that in retrospect seems reckless and wholly unnecessary. Certainly the French could have achieved as much with fewer losses had Savary waited to storm the bridge after Lapisse arrived on Barclay’s flank. “Le Général Milhaud au Général Belliard, Aux avant-postes de Pomichowo, 22 décembre 1806, 2 heures der demie du matin” in Foucart (see below), p. 370-71. “Le Major Général au Maréchal Augereau, Varsovie, 22 décembre 1806” in Foucart (see below), p. 377. “Le Maréchal Augereau au Major Général, Plonsk, 23 décembre 1806” in Foucart (see below), p. 405-8. “Rapport du Général Desjardins sur L’Affaire du 24 Décembre” in Foucart (see below), p. 430-31. “Extrait du Journal des Opérations du 7e Corps” in Foucart (see below), p. 431-33. Lechartier, G. La Manoeuvre de Pultusk (1911). Mikhailovskii-Danilevskii, Aleksandr Ivanovich Opisanie vtoroi voiny imperatora Aleksandra s Napoleonom v 1806 i 1807 godakh (1846). Excerpts translated by Boris Megorsky (unpublished). Sources do not detail the number of battalions of 3rd Jäger at Kolozab. French reports indicate a strength consistent with two battalions and while it is possible that a third battalion was present, it seems more likely that the remaining battalion was at Borkowo. Dorokhov had three battalions at Borkowo on 18 December, two from 1st Jäger and one from 3rd Jäger. It is possible that Dorokhov had a second battalion under his command on the 24th, although French reports note only a single battalion. The presence of at least 2 battalions of 1st Jäger at Sochocin on the 24th makes it likely that the battalion at Borkowo was from 3rd Jäger. Strength estimates are not reported for these forces, but the rough estimates can be based on typical strengths for similar units at this point in the campaign. Russian sources are imprecise regarding artillery dispositions, but consistently note that the horse artillery was in the advanced positions on the Wkra. French reports indicate 6 guns at Sochocin, “many” at Kolozab (6 were captured here), and 5 at Borkowo. Considering the ½ battery of horse artillery at Czarnowo, this suggests that the horse artillery batteries from 2nd and 4th divisions were evenly distributed with a half battery at each of the four points, which would mean that Davydovskii’s battalion(s) were accompanied by a half battery. Desjardin’s report states that Savary was ordered to attack at two points, at the bridge and a short distance upstream. However, Desjardin describes Savary as issuing the orders for the actual storming of the bridge. Desjardin warmly praises Savary’s actions, as does Napoleon in his bulletin. By contrast Commandant Lechartier, writing a century later, condemns the assault as foolish and wasteful. Officer casualties are reported for 105th ligne as 9 killed and wounded during the period 24-26 December. Officer casualties among the other regiments (killed and wounded) at Golymin on the 26th were as follows: 14th ligne – 5; 44th ligne - 6; 16th légère – 8. This suggests that all or most of the officer casualties suffered by 105th ligne were sustained at Golymin and that casualties on the 24th were light in all regiments but 14th ligne. Smith, Napoleon’s Regiments. Foucart, 433.